After a few days in Kuala Lumpur, Malaysia’s skyscraping capital and renowned center for sidewalk rodent-punting, we boarded a bus for the island of Penang. I say island, and I know according to mapmakers and the planet Earth, Penang is indeed one, but it didn’t really feel like an island to me. Penang is massive and since we arrived via a 13 kilometer-long suspension bridge, I thought Penang had more the persona of a coastal city than an island. But hey, that’s just me. 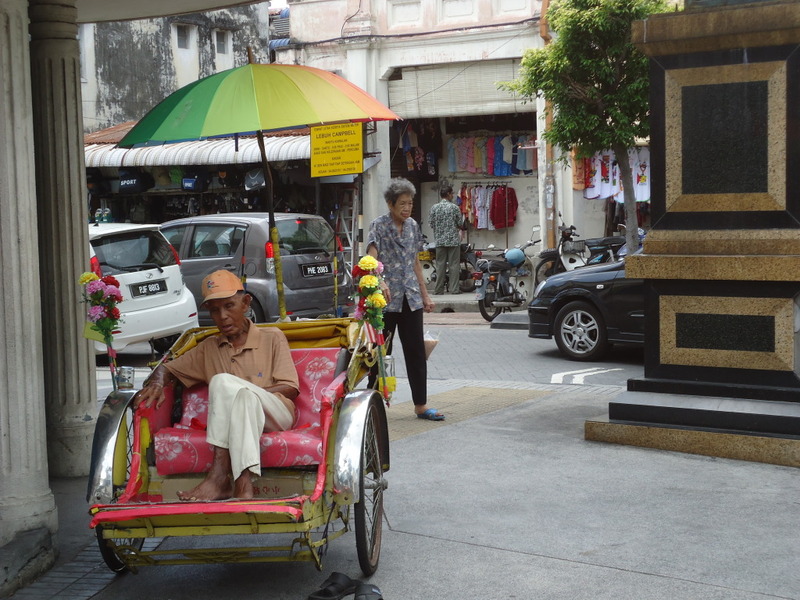 We had heard nothing but great things about Penang beforehand and arrived excited to embrace the culture, the history, the landscapes, and the people. There I go completely making stuff up again – the only things we knew about Penang going in was that it was known for having great street food and was home to some old buildings worth taking pictures of. 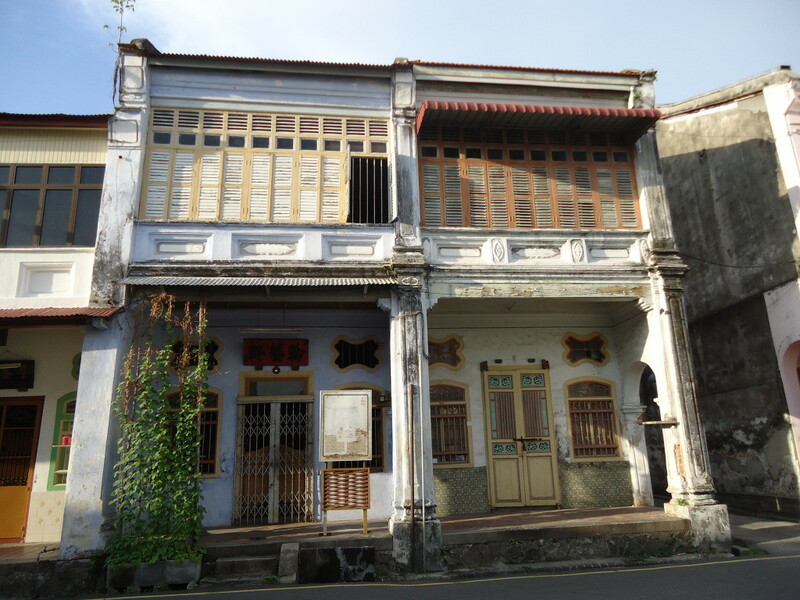 The part of Penang where the great street food and the old buildings worth taking pictures of are located in is called Georgetown, and that is where we ended up staying. We got a little turned around finding our guesthouse on the way in to town, but were directed down the right street by a friendly older Western lady, who seemed like she lived there. She was more than glad to help us, and busted out the directions with the speed and sharpness of someone who, as an expat, probably ends up shepherding turned-around buffoons on a very regular basis. Penang was a bit of a strange stop for us. Sadly, since the entire internet had been collectively beating their chest and howling from the trees about how great it was, a bit of a letdown was inevitable. We enjoyed it, we just weren’t about to start beating our chest and howling from trees about how great the place was. Our experience with the food of Penang was good, but nothing earth shattering. If I recall correctly (I definitely do, I’m just being dramatic), we may have (we did) ended up at a Pizza Hut one night because the street stalls choices were a bit underwhelming (they were fine, we just wanted a stuffed crust pizza). There were indeed pretty buildings to take pictures of, many of them were clustered around a cute little area called Love Lane. I immediately took the name Love Lane to be a sign that Penang is an enclave for freespirited hippy types, but apparently no one really knows how the street got its name. Theories range from Love being somebody important’s surname to the street once being home to a bevy of brothels. Regardless, the name Love Lane fits the little place like a glove. 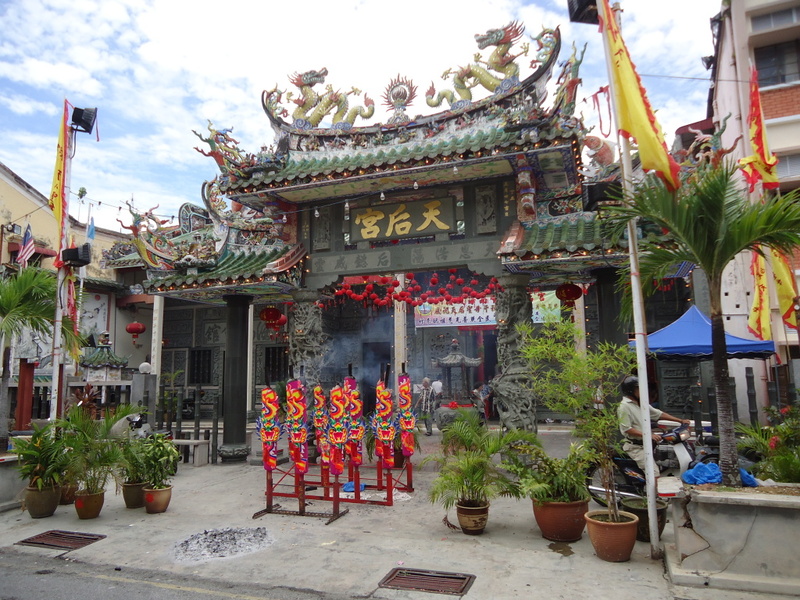 Seeing Penang’s chalk white colonial-era buildings butted up against colorful temples was a thrill for sure, and further hammered home that we had really arrived in Asia. At times, Kuala Lumpur had felt like a step into the future, but Penang definitely felt like a lean back to the past. After being attracted by a trail of incense smoke, we popped into a temple one day and observed something called a ceremony, which definitely felt like the kind of thing we went travelling for in the first place. Like I said, we had a good time in Penang, but for the most part, the only thing earth shattering to happen during our stay was when the earth nearly shattered. Yep, they had an earthquake while we were there. While Missouri is certainly never going to be confused with California or anywhere else on the Ring of Fire, any Missourian worth his or her salt, which I pretend to be by the way, is bizarrely proud to boast about the fact that the New Madrid Fault is located in our fair state. New Madrid Fault? Oh, you didn’t know? That’s right, the New Madrid Fault is responsible for some of the biggest earthquakes in the history of the United States, one that even made the Mississippi River flow backwards. In fact, one of the strongest memories I have of my youth, involves the New Madrid Fault. A cuckoo-for-cocoa-puffs scientist named Iben Browning made a bold prediction that a huge earthquake was going to strike on or around December 3rd, 1990. The media in the Midwest picked up on it and the whole region was a buzz with his fruity forecast. At school, kids were teetering between being afraid the world was about to end just before Christmas and excited for a potential Earthquake Break from classes. Of course nothing happened, but the preceding hoopla will always be etched in my memory. We really didn’t even feel the earthquake on Penang, but were alerted to the fact that it happened by some locals who had all come out to the street to swap stories of dishes shaking (it’s always dishes, isn’t it?). Once back in our guesthouse after chatting with them though, there was a bit of nervous shaking on the internet about a possible tsunami headed our way after the earthquake. In the space of 15 minutes, I read everything online from the dire “run for your lives!” to the genteel advice of “swimming in the sea is not recommended at this time”. The tsunami ended up being mostly internet hype, and hey, wait a minute, I suppose that’s a fitting way to describe our time in Penang.